Match Your Key Number or Build a Lock to Your Specs! 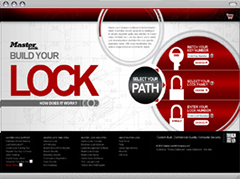 Master Lock continues to set the standard for quality and selection. Building on this tradition, Master Lock ProSeries® and Commercial padlocks can be customized to meet your specific needs. Our make-to-order capabilities allow us to create tailored security solutions for your applications. Choose the best width, material, shackle diameter and length, product weatherability, as well as multiple keying options or laser engraving to secure your property.